Yup, you guessed it… yet another overdrive pedal. I came across this pedal while perusing the forums over at Mark Wein Guitar Lessons. Mark occasionally posts “Pedal of the Day” entries, and this was his latest. I know, lots of people complain about “yet another OD pedal.” But if you stop to think about it, there’s probably a great reason why there are so many OD’s on the market. What comes to mind for me is that no one overdrive can cover everything. Let’s face it, a Tube Screamer or TS-like OD can only take you so far tonally. Don’t get me wrong: Not all OD’s are created equally. Admittedly, there’s lots of crap out there, which is a fallout of the boutique gear movement. I’ve suspected several boutique gear “manufacturers” of simply building gear based on kits, putting a nice paint job on them, then selling the pedal for hundreds of dollars; which is why I’ve always stressed to folks – try before you buy! The LovePedal Kalamazoo is no exception to this rule. While it has some very cool features (I’ll list them below), you really never know how a pedal will work with your rig until you put it in your chain. 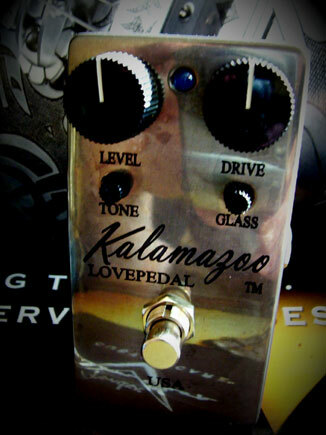 But despite that, I’m really intrigued by LovePedal’s twist on the overdrive with the Kalamazoo. So what’s to like? As you can see, there are two little knobs called Tone and Glass under the common Level and Drive knobs. I believe this is where the magic of the pedal lies. Tone is a treble content roll-off, while glass is a treble booster that doesn’t affect the lows. These are wired in series, so they interact with each other. From what I could gather from the demo from ProGuitarShops I’ve seen, these two knobs offer up a world of tonal possibilities. Another thing that appeals to me is that I prefer a more “open” kind of overdrive to let my power tubes do the compression. To me, it sounds more natural that way. The Kalamazoo was designed to create an “open” type overdrive tone. With it, you can slam the front-end of your amp, and make that gain push the power tubes into compression. And from what I could gather, the Kalamazoo is VERY responsive to input gain, which is demonstrated in the ProGuitarShops video. To top it off, the pedal has a mirror finish! I really dig that! My Creation Audio Labs Mk.4.23 booster has a mirror finish as well. Sweet! And at $199, this is a pedal that will not break the bank! For more information, visit the LovePedal site!